Released in 2015, Joanie’s first book has since gone on to become a #1 Amazon Best Seller, receiving rave reviews by all who have been inspired by it. Watch the book trailer and order your copy below. Joanie’s anticipated new book release will be published in the fall of 2017. 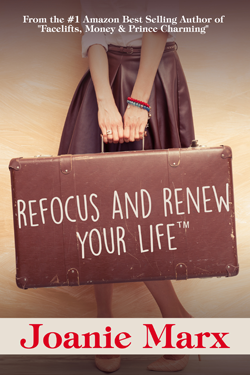 A free download with exclusive excerpts from Refocus & Renew Your Life™ can be found by signing up for the eBook at the bottom of this page. The result of a two-year research project, Joanie is co-authoring this book with author and marketing strategist, Peter Clark Nelson. Excerpts will be offered as a free download on Joanie’s website in June of 2017. 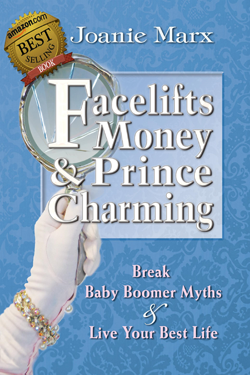 These are just a few of the questions Baby Boomer advocate and Hollywood actress, Joanie “McGranny” Marx, boldly addresses in her new, eye-opening book, “Facelifts, Money and Prince Charming: Break Baby Boomer Myths & Live Your Best Life”. With a rapidly aging population, the desire for living a lengthy and quality life is shattered by media stories that paint a grim picture of those over the age of 55 as slow, unsexy and obsolete. By addressing the myths behind these stories, Marx reveals the secret for undoing the fears of being discarded, unseen and abandoned as we age. 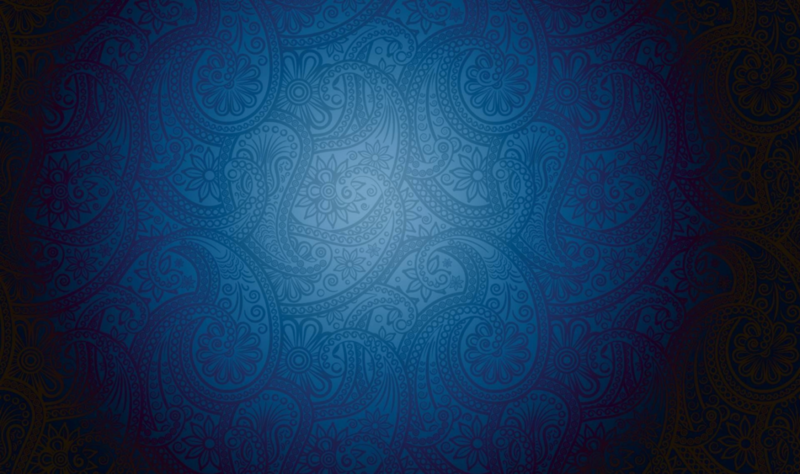 Showing where and how to break the seven myths that shaped the lives of Baby Boomers and all generations that follow, Marx passionately debunks mythical claims that there is not enough love, happiness and success to go around. Along the way she reveals the power of forgiveness and gratitude, as she poignantly weaves in the complex and emotionally charged relationship with her mother. If you’re tired of feeling shamed and blamed into mediocrity, this inspirational book is the key to unlock the hidden treasure for how to live your best life and not the life the media says you should be living. Whether you’re a Baby Boomer or part of a generation that came after them, this is a must-read book. What if we were raised to love ourselves with less shame and blame? Instead of being ridiculed for our differences, how much more of a fulfilling life could any of us have created if we’d been taught to see beauty in the unique ways we genuinely and naturally express ourselves? 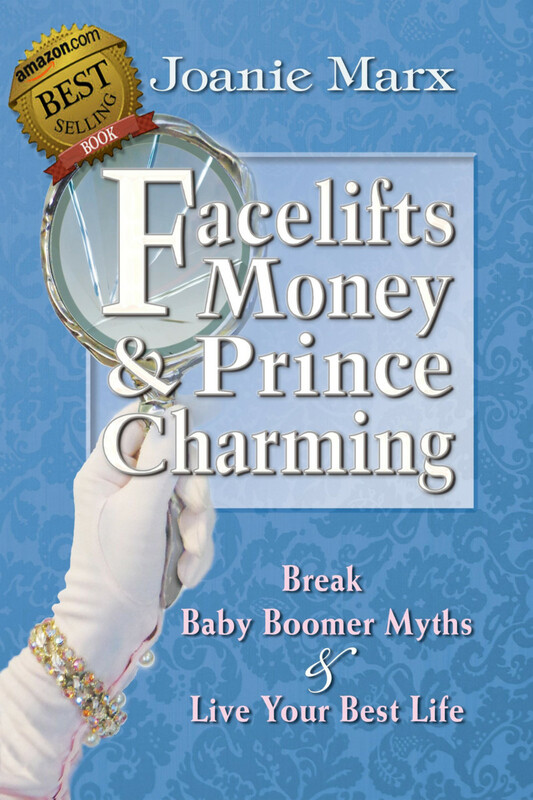 With vivid and emotionally relevant story-telling, #1 Amazon Best Selling Author, Hollywood actress, and Baby Boomer Advocate, Joanie Marx, delivers a life-altering jolt of renewed excitement and refocused optimism in her follow up book to the #1 Amazon Best Selling book, “Facelifts, Money, & Prince Charming”. 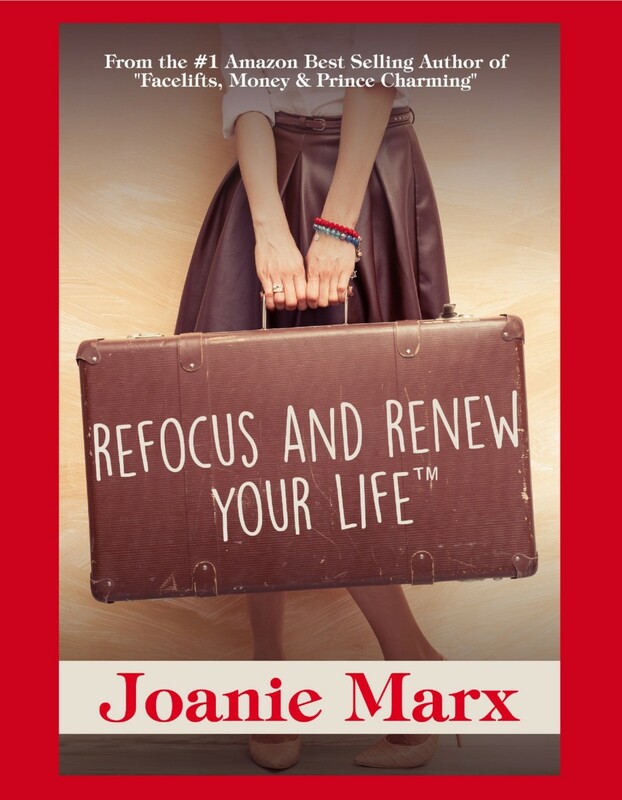 Based on several years of research, coupled with insider knowledge of the entertainment industry and a unique perspective for adopting new beliefs late in life, Joanie shows people of all generations how to rediscover our inner Prince Charming and where to Refocus & Renew Your Life™ in the now of nows. With humor and refreshing honesty, Joanie also addresses the Seven Baby Boomer Myths we were raised on. 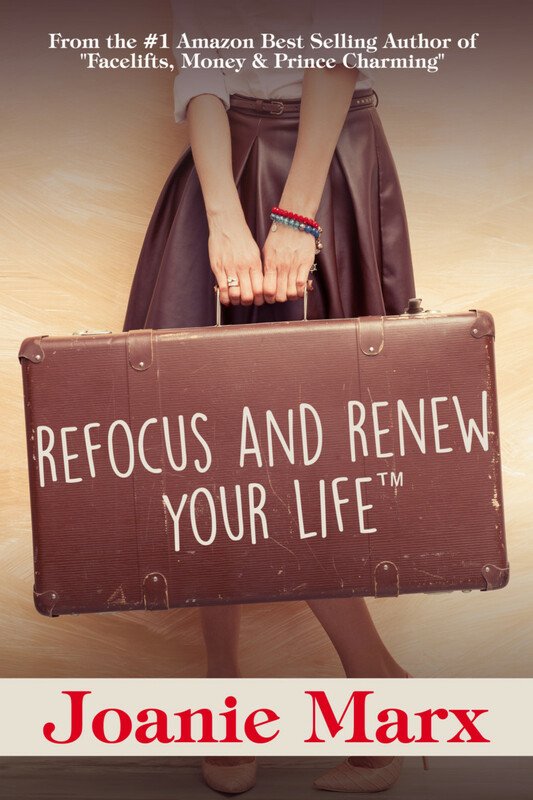 Refocus & Renew Your Life™ is scheduled for publication in the fall of 2017. A free download with exclusive excerpts from Joanie’s anticipated new release can be found by signing up for the eBook at the bottom of this page. You see them everywhere you look. Far more socially and physically active than any previous generation in history, they also carry unparalleled financial influence on society. Yet they are perceived in the world of advertising, and in the media, as unsexy, obsolete and unprofitable. 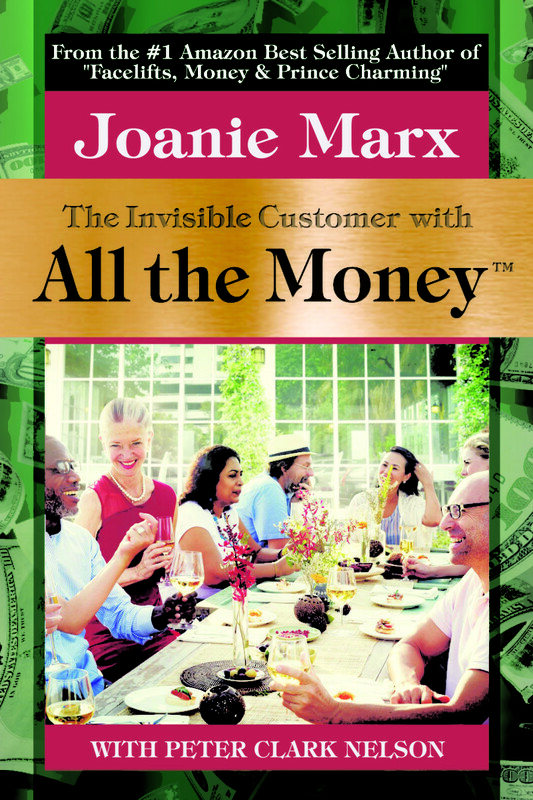 Some call them Baby Boomers, but they are also The Invisible Customer with All the Money™. Once upon a time, Baby Boomers were the most coveted consumer market in the world. So, what happened? 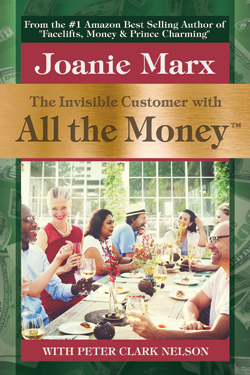 In this groundbreaking eBook #1 Amazon Best Selling Author, Hollywood Actress, and Baby Boomer Advocate, Joanie Marx, along with author and marketing strategist, Peter Clark Nelson, invites you to meet the Invisible Customer With All the Money™. Compelled to do their part in positively changing how the 50+ consumer is perceived and treated, Joanie Marx and Peter Clark Nelson conducted several years of research into the myths and consumer habits of the Baby Boomer market. How your company can profit from the Seven Baby Boomer Myths. Where 80% of boomers spend their time online and why your brand should be there. The most profitable market segments for Baby Boomers (they’re not what you think). How to free your brand from the ‘disengagement theory’. The golden rule of advertising that causes companies to lose billions every year. Three labels that turn Baby Boomers against your brand. The mythical disease that scares companies from advertising to Baby Boomers.